Ellsworth Kelly, the famed hard-edge painter, is known for creating works with bright colors, geometric shapes, and simple lines and forms. His art cuts across painting, print-making, sculpture, even architecture—and now stamps. The USPS recently announced a handful of new stamp designs for 2019, and among them is a series dedicated to Kelly’s wonderfully graphical paintings. 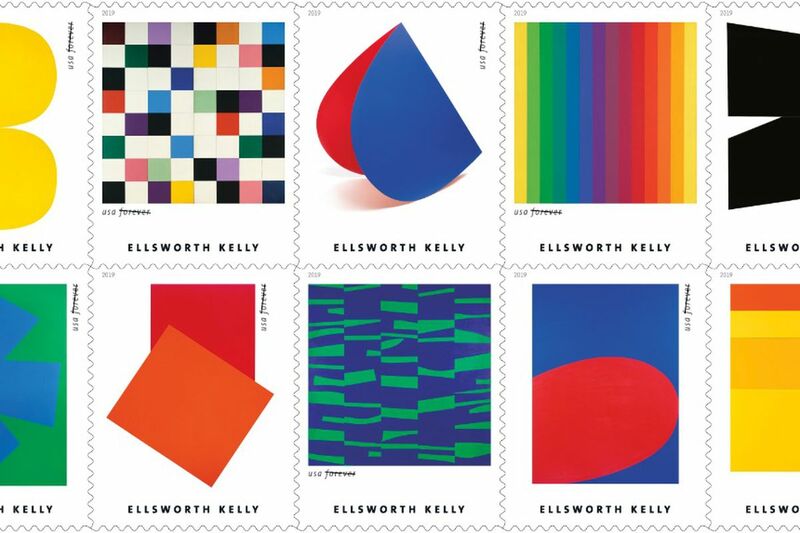 USPS art director Derry Noyes designed a set of ten stamps that show off Kelly works including “Yellow White” (1961), “Colors for a Large Wall” (1951), “Blue Red Rocker” (1963), and “Spectrum I” (1953), among others. All of the works are framed inside the stamp’s ribbed white border, making them feel like tiny, perfect paintings that you can stick on letters to your loved ones or on a check to your landlord. Whoever deserves them most. You can purchase the stamps later this year, and at 55 cents a piece, they’re certainly the cheapest Kelly work you can get your hands on.